For the cores of other planetary bodies, see Planetary core. For broader coverage of this topic, see Structure of the Earth § Core. Earth's inner core is the innermost geologic layer of the Earth. It is primarily a solid ball with a radius of about 1,220 kilometres (760 miles), which is about 20% of the Earth's radius and 70% of the Moon's radius. There are no samples of the Earth’s core available for direct measurement, as there are for the Earth's mantle. The information that we have about it mostly comes from analysis of seismic waves and the magnetic field. The inner core is believed to be composed of an iron–nickel alloy with some other elements. The temperature at the inner core's surface is estimated to be approximately 5,700 K (5,430 °C) or 9806 °F, which is about the temperature at the surface of the Sun. A few years later, in 1940, it was hypothesized that this inner core was made of solid iron. In 1952, F. Birch published a detailed analysis of the available data and concluded that the inner core was probably crystalline iron. The boundary between the inner and outer cores is sometimes called the "Lehmann discontinuity", although the name usually refers to another discontinuity. The name "Bullen" or "Lehmann-Bullen discontinuity", after K. Bullen has been proposed, but its use seems to be rare. The rigidity of the inner core was confirmed in 1971. Dziewoński and Gilbert established that measurements of normal modes of vibration of Earth caused by large earthquakes were consistent with a liquid outer core. In 2005, shear waves were detected passing through the inner core; these claims were initially controversial, but are now gaining acceptance. Almost all direct measurements that we have about the physical properties of the inner core are the seismic waves that pass through it. The most informative waves are generated by deep earthquakes, 30 km or more below the surface of the Earth (where the mantle is relatively more homogeneous) and recorded by seismographs as they reach the surface, all over the globe. Seismic waves include "P" (primary or pressure) waves, compressional waves that can travel through solid or liquid materials, and "S" (secondary or shear) shear waves that can only propagate through rigid elastic solids. The two waves have different velocities and are damped at different rates as they travel through the same material. Of particular interest are the so-called "PKiKP" waves -- pressure waves (P) that start near the surface, cross the mantle-core boundary, travel through the core (K), are reflected at the inner core boundary (i), cross again the liquid core (K), cross back into the mantle, and are detected as pressure waves (P) at the surface. Also of interest are the "PKIKP" waves, that travel through the inner core (I) instead of being reflected at its surface (i). Those signals are easier to interpret when the path from source to detector is close to a straight line -- namely, when the receiver is just above the source for the reflected PKiKP waves, and antipodal to it for the transmitted PKIKP waves. While S waves cannot reach or leave the inner core as such, P waves can be converted into S waves, and vice-versa, as they hit the boundary between the inner and outer core at an oblique angle. The "PKJKP" waves are similar to the PKIKP waves, but are converted into S-waves when they enter the inner core, travel through it as S-waves (J), and are converted again into P waves when they exit the inner core. Thanks to this phenomeon, it is known that the inner core can propagate S waves, and therefore must be solid. The Earth's mass, its gravitational field, and its angular inertia. These are all affected by the density and dimensions of the inner layers. The natural oscillation fequencies and modes of the whole Earth oscillations, when large earthquakes make the planet "ring" like a bell. These oscillations too depend strongly on the density, size, and shape of the inner layers. On the basis of the seismic data, the inner core is estimated to be about 1221 km in radius (2442 km in diameter);, which is about 19% of the radius of the Earth and 70% of that of the Moon. Its volume is about 7.6 billion cubic km (7.6 × 1018 m3), which is about 1/140 (0.7%) of the volume of the whole Earth. Its shape is believed to be very close to an oblate ellipsoid of revolution, like the surface of the earth, only that more spherical: the flattening f is estimated to be between 1/400 and 1/416;:f.2 meaning that the radius along the Earth's axis is estimated to be about 3 km shorter than the radius at the equator. In comparison, the flattening of the earth as a whole is very close to 1/300, and the polar radius is 21 km shorter than the equatorial one. The pressure in the Earth's inner core is slightly higher than it is at the boundary between the outer and inner cores: it ranges from about 330 to 360 gigapascals (3,300,000 to 3,600,000 atm). The acceleration of gravity at the surface of the inner core can be computed to be 4.3 m/s2; which is less than half the value at the surface of the Earth (about 10 m/s2). The density of the inner core is believed to vary smoothly from about 13.0 kg/L (= g/cm3 = t/m3) at the center to about 12.8 kg/L at the surface. As it happens with other material properties, the density drops suddenly at that surface: the liquid just above the inner core is believed to be significantly less dense, at about 12.1 kg/L. For comparison, the average density in the upper 100 km of the Earth is about 3.4 kg/L. That density implies a mass of about 1023 kg for the inner core, which is 1/60 (1.7%) of the mass of the whole Earth. The temperature of the inner core can be estimated from the melting temperature of impure iron at the pressure which iron is under at the boundary of the inner core (about 330 GPa). From these considerations, in 2002 D. Alfè and other estimated its temperature as between 5,400 K (5,100 °C; 9,300 °F) and 5,700 K (5,400 °C; 9,800 °F). However, in 2013 S. Anzellini and others obtained experimentally a substantially higher temperature for the melting point of iron, 6230 ± 500 K.
Iron can be solid at such high temperatures only because its melting temperature increases dramatically at pressures of that magnitude (see the Clausius–Clapeyron relation). In 2010, B. Buffet determined that the average magnetic field in the liquid outer core is about 2.5 milliteslas (25 gauss), which is about 40 times the maximum strength at the surface. He started from the known fact that the Moon and Sun cause tides in the liquid outer core, just as they do on the oceans on the surface. He observed that motion of the liquid through the local magnetic field creates electric currents, that dissipate energy as heat according to Ohm's law. This dissipation in turn dampens the tidal motions and explains previously detected anomalies in Earth’s nutation. From the magnitude of the latter effect he could calculate the magnetic field. The field inside the inner core presumably has a similar strength. While indirect, this measurement does not depend significantly on any assumptions about the evolution of the Earth or the composition of the core. Although seismic waves propagate through the core as if it was solid, they cannot distingush between a perfectly solid material from an extremely viscous one. Some scientists have therefore considered whether there may be slow convection in the inner core (as is believed to exist in the mantle). That could be an explanation for the anisotropy detected in seismic studies. In 2009, B. Buffett estimated the viscosity of the inner core at 1018 Pa·s; which is a sextillion times the viscosity of water, and more than a billion times that of pitch. There is still no direct evidence about the composition of the inner core. However, based on the relative prevalence of various chemical elements in the Solar System, the theory of planetary formation, and constraints imposed or implied by the chemistry of the rest of the Earth's volume, the inner core is believed to consist primarily of an iron–nickel alloy. At the known pressures and estimated temperatures of the core, it is predicted that pure iron could be solid, but its density would exceed the known density of the core by approximately 3%. That result implies the presence of lighter elements in the core, such as silicon, oxygen, or sulfur, in addition to the probable presence of nickel. Recent estimates (2007) allow for up to 10% nickel and 2-3% of unidentified lighter elements. According to computations by D. Alfè and others, the liquid outer core contains 8-13% of oxygen, but as the iron crystallizes out to form the inner core the oxygen is mostly left in the liquid. Laboratory experiments and analysis of seismic wave velocities seems to indicate that the inner core consists specificaly of ε-iron, a crystalline form of the metal with the hexagonal close-packed (hcp) structure. That structure can still admit the inclusion of small amounts of nickel and other elements. Also, if the inner core grows by precipitation of frozen particles falling onto its surface, then some liquid can also be trapped in the pore spaces. In that case, some of this residual fluid may still persist to some small degree in much of its interior. Many scientists had initially expected that the inner core would be found to be homogeneous, because that same process should have proceeded uniformly during its entire formation. It was even suggested that Earth's inner core might be a single crystal of iron. In 1983, G. Poupinet and others observed that the travel time of PKIKP waves (P-waves that travel through the inner core) was about 2 seconds less for straight north-south paths than traight paths on the equatorial plane. Even taking into account the flattening of the Earth at the poles (about 0.33% for the whole Earth, 0.25% for the inner core) and crust and upper mantle heterogeneities, this difference implied that P waves (of a broad range of wavelengths) travel through the inner core about 1% faster in the north-south direction than along directions perpendicular to that. This P-wave speed anisotropy has been confirmed by later studies, incluing more seismic data and study of the free oscillations of the whole Earth.Some authors have claimed higher values for the difference, up to 4.8%; however, in 2017 D. Frost and B. Romanowicz confirmed that the value is between 0.5% and 1.5%. Some authors have claim that P-wave speed is faster in directions that are oblique or perpendicular to the N-S axis, at least in some regons of the inner core. However, these claims have been disputed by D. Frost and B. Romanowicz, who instead claim that the direction of maximum speed is as close to the Earth's rotation axis as can be determined. Laboratory data and theoretical computations indicate that the propagation of pressure waves in the hcp crystals of ε-iron are strongly anistropic too, with one "fast" axis and two equally "slow" ones. A preference for the crystals in the core to align in the north-south direction could account for the observed seismic anomaly. One phenomenon that could cause such partial alignment is slow flow ("creep") inside the inner core, from the equator towards the poles or vice-versa. That flow would cause the crystals to partially reorient themselves accoding to the direction of the flow. In 1996, S. Yoshida and others proposed that such a flow could be caused by higher rate of freezing at the equator than at polar latitudes. An equator-to-pole flow then would set up in the inner core, tending to restore the isostatic equilibrium of its surface. Others suggested that the required flow could be caused by slow thermal convection inside the inner core.T. Yukutake claimed in 1998 that such convective motions were unliley. However, B. Buffet in 2009 estimated the viscosity of the inner core and found that such convection could have happened, especially when the core was smaller. On the other hand, M. Bergman in 1997 proposed that the anisotropy was due to an observed tendency of iron crystals to grow faster when their crystallographic axes are aligned with the direction of the cooling heat flow. He therefore proposed that the heat flow out of the inner core would be biased towards the radial direction. In 1998, S. Karato proposed that changes in the magnetic field might also deform the inner core slowly over time. In 2002, M. Ishii and A. Dziewoński presented evidence that the solid inner core contained an "innermost inner core" (IMIC) with somewhat different properties than the shell around it. The nature of the differences and radius of the IMIC are still unresolved as of 2019, with proposals for the latter ranging from 300 km to 750 km. A. Wang and X. Song recently proposed a three-layer model, with an "inner inner core" (IIC) with about 500 km radius, an "outer inner core" (OIC) layer about 600 km thick, and an isotropic shell 100 km thick. In this model, the "faster P-wave" direction would be parallel to the Earth's axis in the OIC, but perpendicular to that axis in the IIC. However, conclusion has been disputed by claims that there need not be sharp discontinuities in the inner core, only a gradual change of properties with depth. Alboussère and others proposed that this asymmetry could be due to melting in the Eastern hemisphere and re-crystallization in the Western one. C. Finlay conjectured that this process could explain the asymmetry in the Earth's magnetic field. However, in 2017 D. Frost and B. Romanowicz disputed those earlier inferences, claiming that the data shows only a weak anisotropy, with the speed in the N-S direction being only 0.5 to 1.5% faster than in equatorial directions, and no clear signs of E-W variation. Other researchers claim that he properties of the inner core's surface vary from place to place across distances as small as 1 km. This variation is surprising, since lateral temperature variations along the inner-core boundary are known to be extremely small (this conclusion is confidently constrained by magnetic field observations). 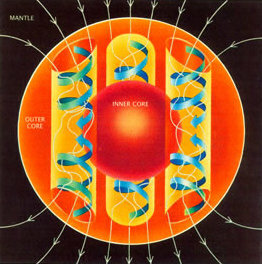 Schematic of the Earth's inner core and outer core motion and the magnetic field it generates. 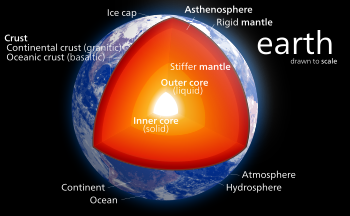 The Earth's inner core is thought to be slowly growing as the liquid outer core at the boundary with the inner core cools and solidifies due to the gradual cooling of the Earth's interior (about 100 degrees Celsius per billion years). According to calculations by Alfé and others, as the iron crystallizes onto the inner core, the liquid just above it becomes enriched in oxygen, and therefore less dense than the rest of the outer core. This process creates convection currents in the outer core, which are thought to be the prime driver for the currents that create the Earth's magnetic field. The existence of the inner core also affects the dynamic motions of liquid in the outer core, and thus may help fix the magnetic field. Because the inner core is not rigidly connected to the Earth's solid mantle, the possibility that it rotates slightly more quickly or slowly than the rest of Earth has long been entertained. In the 1990s, seismologists made various claims about detecting this kind of super-rotation by observing changes in the characteristics of seismic waves passing through the inner core over several decades, using the aforementioned property that it transmits waves more quickly in some directions. In 1996, X. Song and P. Richards estimated this "super-rotation" of the inner core relative to the mantle as about one degree per year. In 2005, they and J. Zhang compared recordings of "seismic doublets" (recordings by the same station of earthquakes occurring in the same location on the opposite side of the Earth, years apart), and revised that estimate to 0.3 to 0.5 degree per year. In 1999, M. Greff-Lefftz and H. Legros noted that the gravitational fields of the Sun and Moon that are responsible for ocean tides also apply torques to the Earth, affecting its axis of rotation and a slowing down of its rotation rate. Those torques are felt mainly by the crust and mantle, so that their rotation axis and speed may differ from overall rotation of the fluid in the outer core and the rotation of the inner core. The dynamics is complicated because of the currents and magnetic fields in the inner core. They find that the axis of the inner core wobbles (nutates) slightly with a period of about 1 day. With some assumptions on the evolution of the Earth, they conclude that the fluid motions in the outer core would have entered resonance with the tidal forces at several times in the past (3.0, 1.8, and 0.3 billion years ago). During those epochs, which lasted 200-300 million years each, the extra heat generated by stronger fluid motions migh have stopped the growth of the inner core. Theories about the age of the core are necessarily part of theories of the history of Earth as a whole. This has been a long debated topic and is still under discussion at the present time. It is widely believed that the Earth’s solid inner core formed out of an initially completely liquid core as the Earth cooled down. However, there is still no firm evidence about the time when this process started. Two main approaches have been used to infer the age of the inner core: thermodynamic modeling of the cooling of the Earth, and analysis of paleomagnetic evidence. The estimates yielded by these methods still vary over a large range, from 0.5 to 2 billion years old. Heat flow of the inner earth, according to S. T. Dye and R. Arevalo. One of the ways to estimate the age of the inner core is by modeling the cooling of the Earth, constrained by a minimum value for the heat flux at the core–mantle boundary (CMB). That estimate is based on the prevailing theory that the Earth's magnetic field is primarily triggered by convection currents in the liquid part of the core, and the fact that a minimum heat flux is required to sustain those currents. The heat flux at the CMB at present time can be reliably estimated because it is related to the measured heat flux at Earth’s surface and to the measured rate of mantle convection. In 2001, S. Labrosse and others, assuming that there were no radioactive elements in the core, gave an estimate of 1±0.5 billion years for the age of the inner core — considerably less than the estimated age of the Earth and of its liquid core (about 4.5 billion years) In 2003, the same group concluded that, if the core contained a reasonable amount of radioactive elements, the inner core's age could be a few hundred million years older. In 2012, theoretical computations by M. Pozzo and others indicated that the electrical conductivity of iron and other hypothetical core materials, at the high pressures and temperatures expected there, were two or three times higher than assumed in previous research. These predictions were confirmed in 2013 by measurements by Gomi and others. The higher values for electrical conductivity led to increased estimates of the thermal conductivity, to 90 W/m/K; which, in turn, lowered estimates of its age to less than 700 million years old. However, in 2016 Konôpková and others directly measured the thermal conductivity of solid iron at inner core conditions, and obtained a much lower value, 18-44 W/m/K. With those values, they obtained an upper bound of 4.2 billion years for the age of the inner core, compatible with the paleomagnetic evidence. Another way to estimate the age of the Earth is to analyze changes in the magnetic field of Earth during its history, as trapped in rocks that formed at various times (the "paleomagnetic record"). The presence or absence of the solid inner core could result in very different dynamic processes in the core which could lead to noticeable changes in the magnetic field. In 2011, Smirnov and others published an analysis of the paleomagnetism in a large sample of rocks that formed in the Neoarchean (2.8 to 2.5 billion years ago) and the Proterozoic (2.5 to 0.541 billion). They found that the geomagnetic field was closer to that of a magnetic dipole during the Neoarchean than after it. They interpreted that change as evidence that the dynamo effect was more deeply seated in the core during that epoch, whereas in the later time currents closer to the core-mantle boundary grew in importance. They further speculate that the change my have been due to growth of the solid inner core between 3.5 an 2 billion years ago. An analysis of rock samples from the Ediacaran epoch (formed about 565 million years ago), published by Bono and others in 2019, revealed unusually low intensity and two distinct directions for the geomagnetic field during that time. Considering other evidence of high frequency of magnetic field reversals around that time, they speculate that those anomalies could be due to the onset of formation of the inner core, which would then be 0.5 billion years old. ^ Monnereau, Marc; Calvet, Marie; Margerin, Ludovic; Souriau, Annie (May 21, 2010). "Lopsided Growth of Earth's Inner Core". Science. 328 (5981): 1014–1017. Bibcode:2010Sci...328.1014M. doi:10.1126/science.1186212. PMID 20395477. ^ Engdahl, E. R.; Flinn, E. A.; Massé, R. P. (1974). "Differential PKiKP Travel Times and the Radius of the Inner Core". Geophysical Journal International. 39 (3): 457–463. doi:10.1111/j.1365-246x.1974.tb05467.x. ^ a b Allègre, Claude J.; Manhès, Gérard; Göpel, Christa (April 1995). "The age of the Earth". Geochimica et Cosmochimica Acta. 59 (8): 1445–1456. doi:10.1016/0016-7037(95)00054-4. ISSN 0016-7037. ^ Edmond A. Mathez, ed. (2000). Earth: inside and Out. American Museum of Natural History. ^ (2008): "Inge Lehmann: Discoverer of the Earth's Inner Core ". Web document in the Earth Inside Out Curriculum Collection. American Museum of National History. Acessed on 2019-04-07. ^ Inge Lehmann (1936): "P'". Publications du Bureau central séisismologique international, Série A: Travaux scientfiques, fascicule 14, pages 87-115. ^ Bruce A. Bolt and Erik Hjortenberg (1994): "Memorial essay: Inge Lehmann (1888-1993)". Bulletin of the Seismological Society of America, obituary, volume 84, issue 1, pages 229-233. ^ Robert E Krebs (2003). The basics of earth science. Greenwood Publishing Company. ISBN 978-0-313-31930-3. ^ Lee, William H. K.; Kanamori, Hiroo; Jennings, Paul C.; Kisslinger, Carl, eds. (2002). International Handbook of Earthquake and Engineering Seismology; part A. Academic Press. p. 926. ISBN 978-0-12-440652-0. ^ A. M. Dziewoński; F. Gilbert (1971-12-24). "Solidity of the Inner Core of the Earth inferred from Normal Mode Observations". Nature. 234 (5330): 465–466. Bibcode:1971Natur.234..465D. doi:10.1038/234465a0. ^ Robert Roy Britt (2005-04-14). "Finally, a Solid Look at Earth's Core". Retrieved 2007-05-22. ^ David. R. Lide, ed. (2006–2007). CRC Handbook of Chemistry and Physics (87th ed.). pp. j14–13. ^ Dziewoński, Adam M.; Anderson, Don L. (1981). "Preliminary reference Earth model". Physics of the Earth and Planetary Interiors. 25 (4): 297–356. Bibcode:1981PEPI...25..297D. doi:10.1016/0031-9201(81)90046-7. ^ S. Anzellini; A. Dewaele; M. Mezouar; P. Loubeyre & G. Morard (2013). "Melting of Iron at Earth's Inner Core Boundary Based on Fast X-ray Diffraction". Science. 340 (6136): 464–466. Bibcode:2013Sci...340..464A. doi:10.1126/science.1233514. ^ Anneli Aitta (2006-12-01). "Iron melting curve with a tricritical point". Journal of Statistical Mechanics: Theory and Experiment. 2006 (12): 12015–12030. arXiv:cond-mat/0701283. Bibcode:2006JSMTE..12..015A. doi:10.1088/1742-5468/2006/12/P12015. ^ Anneli Aitta (2008-07-01). "Light matter in the core of the Earth: its identity, quantity and temperature using tricritical phenomena". arXiv:0807.0187. ^ Stixrude, Lars; Wasserman, Evgeny; Cohen, Ronald E. (1997-11-10). "Composition and temperature of Earth's inner core". Journal of Geophysical Research: Solid Earth. 102 (B11): 24729–24739. Bibcode:1997JGR...10224729S. doi:10.1029/97JB02125. ISSN 2156-2202. ^ Broad, William J. (1995-04-04). "The Core of the Earth May Be a Gigantic Crystal Made of Iron". NY Times. ISSN 0362-4331. Retrieved 2010-12-21. ^ S.I. Yoshida; I. Sumita & M. Kumazawa (1996). "Growth model of the inner core coupled with the outer core dynamics and the resulting elastic anisotropy". Journal of Geophysical Research: Solid Earth. 101 (B12): 28085–28103. Bibcode:1996JGR...10128085Y. doi:10.1029/96JB02700. ^ T. Yukutake (1998). "Implausibility of thermal convection in the Earth's solid inner core". Phys. Earth Planet. Inter. 108 (1): 1–13. Bibcode:1998PEPI..108....1Y. doi:10.1016/S0031-9201(98)00097-1. ^ S. I. Karato (1999). "Seismic anisotropy of the Earth's inner core resulting from flow induced by Maxwell stresses". Nature. 402 (6764): 871–873. Bibcode:1999Natur.402..871K. doi:10.1038/47235. ^ Kazuro Hirahara; Toshiki Ohtaki & Yasuhiro Yoshida (1994). "Seismic structure near the inner core-outer core boundary". Geophys. Res. Lett. 51 (16): 157–160. Bibcode:1994GeoRL..21..157K. doi:10.1029/93GL03289. ^ Alboussière, T.; Deguen, R.; Melzani, M. (2010). "Melting-induced stratification above the Earth's inner core due to convective translation". Nature. 466 (7307): 744–747. arXiv:1201.1201. Bibcode:2010Natur.466..744A. doi:10.1038/nature09257. PMID 20686572. ^ "Figure 1: East–west asymmetry in inner-core growth and magnetic field generation." from Finlay, Christopher C. (2012). "Core processes: Earth's eccentric magnetic field". Nature Geoscience. 5 (8): 523–524. Bibcode:2012NatGe...5..523F. doi:10.1038/ngeo1516. ^ Aaurno, J. M.; Brito, D.; Olson, P. L. (1996). "Mechanics of inner core super-rotation". Geophysical Research Letters. 23 (23): 3401–3404. Bibcode:1996GeoRL..23.3401A. doi:10.1029/96GL03258. ^ Xu, Xiaoxia; Song, Xiaodong (2003). "Evidence for inner core super-rotation from time-dependent differential PKP traveltimes observed at Beijing Seismic Network". Geophysical Journal International. 152 (3): 509–514. Bibcode:2003GeoJI.152..509X. CiteSeerX 10.1.1.210.8362. doi:10.1046/j.1365-246X.2003.01852.x. ^ R. Monasterski (1996-07-20). "Putting a New Spin on Earth's Core". Science News. 150 (3): 36. JSTOR 3980339?seq=1. ^ a b c Labrosse, Stéphane; Poirier, Jean-Paul; Le Mouël, Jean-Louis (2001). "The age of the inner core". Earth and Planetary Science Letters. 190 (3–4): 111–123. Bibcode:2001E&PSL.190..111L. doi:10.1016/S0012-821X(01)00387-9. ISSN 0012-821X. ^ a b Labrosse, Stéphane (November 2003). "Thermal and magnetic evolution of the Earth's core". Physics of the Earth and Planetary Interiors. 140 (1–3): 127–143. doi:10.1016/j.pepi.2003.07.006. ISSN 0031-9201. ^ a b Smirnov, Aleksey V.; Tarduno, John A.; Evans, David A.D. (August 2011). "Evolving core conditions ca. 2 billion years ago detected by paleosecular variation". Physics of the Earth and Planetary Interiors. 187 (3–4): 225–231. doi:10.1016/j.pepi.2011.05.003. ^ a b Labrosse, Stéphane (October 2015). "Thermal evolution of the core with a high thermal conductivity". Physics of the Earth and Planetary Interiors. 247: 36–55. doi:10.1016/j.pepi.2015.02.002. ISSN 0031-9201. ^ a b Biggin, A. J.; Piispa, E. J.; Pesonen, L. J.; Holme, R.; Paterson, G. A.; Veikkolainen, T.; Tauxe, L. (October 2015). "Palaeomagnetic field intensity variations suggest Mesoproterozoic inner-core nucleation". Nature. 526 (7572): 245–248. doi:10.1038/nature155236. ^ a b Ohta, Kenji; Kuwayama, Yasuhiro; Hirose, Kei; Shimizu, Katsuya; Ohishi, Yasuo (June 2016). "Experimental determination of the electrical resistivity of iron at Earth's core conditions". Nature. 534 (7605): 95–98. doi:10.1038/nature17957. ^ a b Konôpková, Zuzana; McWilliams, R. Stewart; Gómez-Pérez, Natalia; Goncharov, Alexander F. (June 2016). "Direct measurement of thermal conductivity in solid iron at planetary core conditions". Nature. 534 (7605): 99–101. doi:10.1038/nature18009. ^ a b Bono, Richard K.; Tarduno, John A.; Nimmo, Francis; Cottrell, Rory D. (2019-01-28). "Young inner core inferred from Ediacaran ultra-low geomagnetic field intensity". Nature Geoscience. 12 (2): 143–147. doi:10.1038/s41561-018-0288-0. ^ Dye, S. T. (September 2012). "Geoneutrinos and the radioactive power of the Earth". Reviews of Geophysics. 50 (3). arXiv:1111.6099. doi:10.1029/2012rg000400. ISSN 8755-1209. ^ Arevalo, Ricardo; McDonough, William F.; Luong, Mario (February 2009). "The K/U ratio of the silicate Earth: Insights into mantle composition, structure and thermal evolution". Earth and Planetary Science Letters. 278 (3–4): 361–369. doi:10.1016/j.epsl.2008.12.023. ISSN 0012-821X. ^ Mollett, S. (March 1984). "Thermal and magnetic constraints on the cooling of the Earth". Geophysical Journal International. 76 (3): 653–666. doi:10.1111/j.1365-246x.1984.tb01914.x. ISSN 0956-540X. ^ Pozzo, Monica; Davies, Chris; Gubbins, David; Alfè, Dario (2012-04-11). "Thermal and electrical conductivity of iron at Earth's core conditions". Nature. 485 (7398): 355–358. doi:10.1038/nature11031. ^ Gomi, Hitoshi; Ohta, Kenji; Hirose, Kei; Labrosse, Stéphane; Caracas, Razvan; Verstraete, Matthieu J.; Hernlund, John W. (2013-11-01). "The high conductivity of iron and thermal evolution of the Earth's core". Physics of the Earth and Planetary Interiors. 224: 88–103. doi:10.1016/j.pepi.2013.07.010.